This phodnichi poli - leftover chapati upma recipe is from Maharashtra. Phodnichi poli is also known as 'policha kuskara'. Kuskara means 'crushed'. It is a one dish meal and easy to make. It is made using left over chapaties. You can make it with one or two day old chapaties. Phodnichi poli is usually made to use up left over chapati. 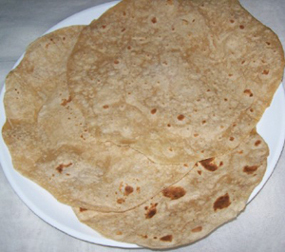 You may make it with fresh chapaties too but leftover chapatis are usually a bit dryer so it is easy to break them into pieces. You can make it for any meal, breakfast, lunch or dinner. Make it when you do not have time to cook an elaborate meal. Red chili powder - 1/4 tsp, more or less according to taste. Tear up chapaties using your fingers or stack them up and use a knife or scissors to cut into small pieces. It depends on you how small or big your like the pieces. I usually use my food processor with chopping blade as I prefer them in small pieces. If I do not wish to use food processor, I tear chapaties in large pieces and rub the torn pieces between my palms to crush them to smaller pieces. Heat oil in a pan. Add mustard seeds and cumin seeds (if adding) and let them splutter. Add chopped onion, curry leaves and fry for a few seconds. Cover and cook for a minute or two, till onions are just done. Add chapati pieces, red chili powder and salt. Mix well. Cover and cook for a minute. Add chopped coriander leaves, fresh grated coconut. Mix. Phodnichi poli / leftover chapati upma is ready. Serve it as a meal by itself or with a cucumber or tomato salad/ slices. The combination of turmeric and red chili powder gives it a lovely color. You can see that the basic recipe needs very few ingredients. You may add the optional spices and ingredients for a variety and according to the liking of your family. You may add 1/4 tsp garam masala or maharashtrian goda masala. You may add 1 tsp metkoot. Metkoot is a special spicy powder made in Maharashtra and Karnataka. In Karnataka, it is known as 'Menthye hittu'. You may add chopped or crushed garlic and ginger. you may use ginger garlic paste. You may add other chopped vegetables such as potato, fresh green peas. I usually add only onion.Sometimes I add a tomato too.